A very long time ago in the country of France, there live a King. The King was a wonderful ruler, and his people lived well. He always wanted the best for his people. When he grew old, he gave all his lands and estates to his only son. It was his desire that his son would use his youth to serve the people even better than he had done himself. The old king offered to step down from his throne and to give the crown to his son, requesting only requested two things. "First, take good care of my people," stated the king. "The second thing is that you must promise to take the best possible care of me in my old age. Return the love I have given to you, and I know I will be well cared for." When these two things were promised, the King held an official ceremony and crowned his son King. The son followed his father's advice at first and saw his treasuries grow and saw his people continue to be contented and living well. He also followed through on his promise to care for his father. Both of these things remained true until the son took a wife. The wife did not like the father. She thought the old man was always in the road. Besides, the son listened more to his father's advice than to the words of his wife. Spitefully she said, ?The old man is always coughing at the table until it takes away all my pleasure in eating. In addition, he treats you like a child, always giving you advice about how to run the country. You are the King now. He had his turn and gave the country to you when he could no longer run it." To please her, the son gave his father a place to lie beneath the stairs. The guards were given orders by the wife that the old man was not to be allowed back into the main part of the palace again. The area where he was given to sleep was cold and drafty. For many years he lay there on a bed of hay and straw like one they would make for the dogs. The father was even given his meals beneath the stairs and was almost like a prisoner in his own castle. The old man's pride was hurt, and he was very sad. Then one day, the queen gave birth to a son, who grew into a proud and virtuous lad. Despite what his mother said, he spent as much time as he could under the stairs with his Grandfather talking to him and learning from him. He developed a caring heart. He brought whatever food and drink he could find to his grandfather. As much as his grandfather enjoyed the food and drink, he loved most of all the kindness and love that the child showed to him as he grew up. One day the grandfather asked for an old horse blanket to protect him from the cold, and the good young lad ran off to fulfill his wish. In the stall he found a good horse blanket. He took it from the horse and ripped it in two. 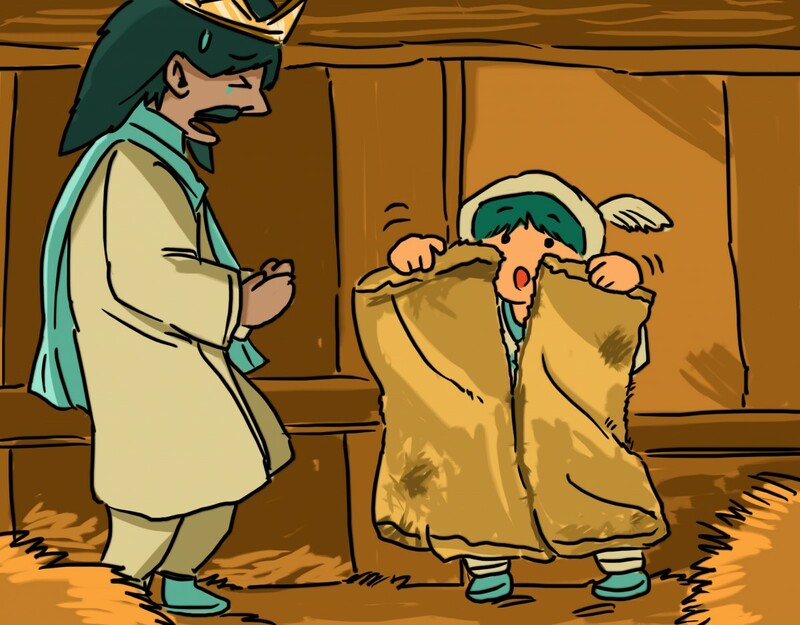 The boy's father saw him tearing the blanket in half and asked him what he was doing with the horse blanket. "I am taking half of it for your father's bed," he said. The king asked his son, "Why are you taking him only half the blanked?" His son answered, "I am saving the other half for you to help you sleep under the stairs when I become the king." Now, it is for you, the reader, to decide whether conditions changed for the old man at the palace. Can thinking of the future possibly change the present? Note: Versions of this story have been around since the middle ages. Dr. Lockett framed his version of the story around a translation by D. L. Ashliman. Ashkiman translated a ballad called "Das vierte Gebot" (The Fourth Commandment -- "Honor your father and your mother") into a story. Ashliman's website is at http://www.pitt.edu/~dash/ashliman.html in case you wish to read other stories he has translated. Visit www.mikelockett.com to read more stories by Dr. Lockett and to learn about his storytelling books and CDs. Then write Moke@mikelockett.com to book Dr. Lockett for storytelling programs and young authors assemblies.